The aim of placing antipersonnel mines, is to wound and kill people. The charges can also impede a vehicle by damaging wheels or fuel tanks. The amount of explosive is generally too small to damage a heavy armored vehicle. The initiating system is generally a pressure, tilt rod or pull-activated device with a detonator embedded in the high explosive charge. Some are further boobytrapped against lifting out of the ground. There are an estimated 110 million anti-personnel mines buried in countries around the world and they kill and maim people every day. These devices come in many shapes, sizes and colors. This poster is an essential reference training aid for police, military and security awareness training. 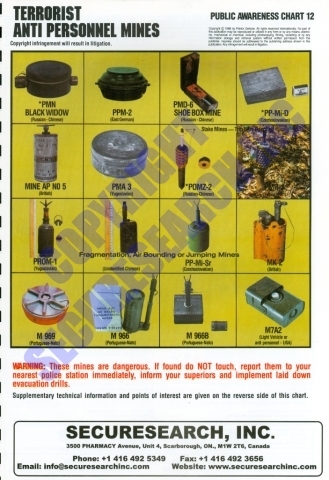 Anti-personnel mines are small, lightweight explosive charges in a wood, metal or plastic housing. They may be completely or partly buried, or may be hidden in tall grass.